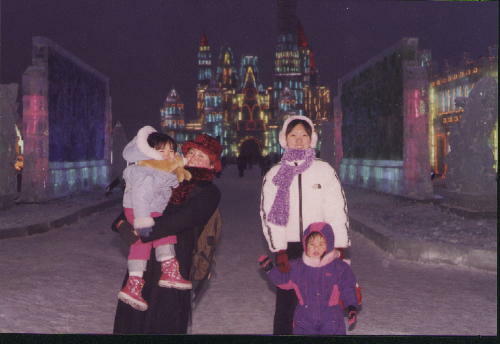 Harbin was absolutely wonderful. We all had a great time! 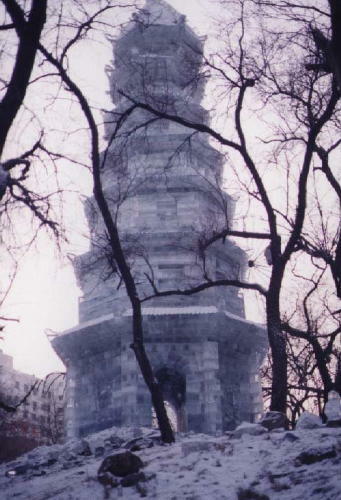 Harbin is a city with a population of about 10 million. It is an 11 hour train ride north of Jinzhou. We boarded the sleeper train in Jinzhou at 7:30 on New Year's Eve. We had tried to get tickets for the 30th, but all the sleeper tickets had sold out except for 4 top sleepers and those are way to high for children to safely sleep on. Nancy sweet talked the train ticket attendant into selling us tickets for the 31st a day early so we were able to get 2 bottom sleepers and 2 middle sleepers. I thought the girls could sleep on one bottom bunk with me on the other and Nancy and Sarah could sleep on the middle bunks. As it turned out the girls opted to sleep with Nancy and Sarah so one bottom bunk was wasted. I did notice however, that during the night the conductor half slept on this bunk with us, so it definitely gave me a sense of safety. Apparently there is a problem with thieves on the sleeper cars, they steal your belongings when you are asleep.....not with the conductor in your berth though! I had hoped there would be some New Year's Eve festivity going on but on the train it was business as usual. The lights were turned out at 9:30 and we all retired. Sleeping on a train is somewhat of an experience in itself. We purchased "hard sleeper" tickets. And yes they were pretty hard. The sleeper cars have about 30 or so pods, each pod has 6 bunks facing each other. They give you a pillow, sheet and a very warm blanket. I think China has the market cornered on warm blankets, people over here hate to be cold. Plus there was a bottom sheet already on the bunk. When you get on the train, the first thing you do is put your suitcases up on the rack, then you sit down and start eating sunflower seeds. We brought 2 big bags and weren't able to finish them all. Then you break out your knitting. Many many women over here knit. They came by about 9:15 and told us they'd be turning out the lights in a few minutes so we all got ready for bed, you just take off your shoes and stow your stuff so the thieves don't get it and bed down. The bunks are about as wide as I am (as my father used to say....one axe handle across) and as I mentioned earlier, they are pretty hard, but it sure beats sitting up all night on either the hard seats or soft seats. I didn't really sleep all that well and neither did the girls, I heard them cry out several times during the night, but they were each sleeping with Nancy and Sarah so they were immediately comforted. The train lights came back on shortly before 6:00 as we were due to arrive in Harbin at about 6:15. The train was nice and warm, but once we got to Harbin and the doors opened, I wasn't quite prepared for the blast of Arctic air that hit me. We were only a few miles from Siberia and let me tell you it was cold! I hadn't worn my maocu on the train as I knew I'd burn up, but when we got off the train I wished I had. 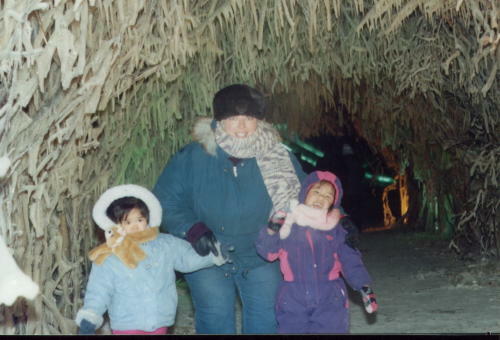 It was however, the only time I was really cold. 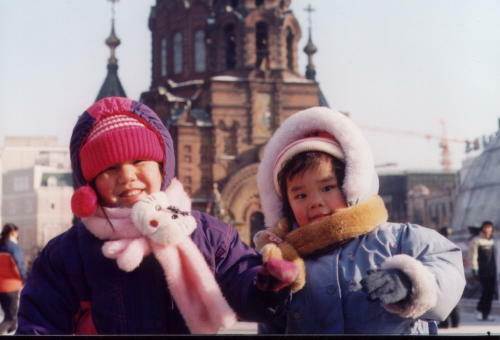 Sarah had a friend who attends one of the universities in Harbin meet us at the train station. There were people everywhere and I don't know how he found us, but he did. He took my suitcase and off we went to catch a cab. We got to the hotel a little after 7:00 and checked in. Because we got a "special" room rate (400 yuan $50.00 instead of the usual 580 yuan per night) they only gave us one free breakfast per room. The advertised rate on the buffet was nearly 80 yuan so we decided to forget that and headed next door to the McDonalds! All 6 of us ate for less than 80 yuan. The next morning I went to the front desk and demanded to speak to the hotel manager (who was on vacation because of the holiday) I got one of the assistant managers. I told Nancy to translate EVERYTHING ie. some well placed curse words. I told them I'd stayed in 5 star hotels all over China....Shanghai, Beijing, Hong Kong, Kunming, Hefei and Changsha (which was true, I did during my adoption trips) and I'd never only had 1 breakfast per room. Also the last hotel I'd stayed in which was in Changsha was only $45.00 per night. Well I guess I appeared irate enough that they decided to give us 4 breakfasts for our 2 rooms. Thank you very much! Nancy and Sarah loved the buffet. It was mostly western fare. They had their first bacon (which wasn't all that good) but they really liked it. I also had to give them knife and fork lessons as there were no chop sticks. I taught them the American method of cutting with your right hand then putting the knife down and placing the fork in your right hand, as well as the English method of leaving the fork in your left hand and putting the food in what I would consider upside down. The buffet also had a small variety of pastries which we all enjoyed, especially Sarah and Nancy. They both liked the buffet so much that on our last morning there, I had made arrangements to meet our new friends (more about them later) at the McDonalds for breakfast, Nancy and Sarah opted not to join us as they really wanted to hit the buffet again. Anyway after breakfast at Micky D's that first morning we all went back to our rooms and Nancy and Sarah went with Sarah's friend to buy our return train tickets and visit his college campus. Julie, Charlie and I bundled up and went out for a little walk to see what we could see. 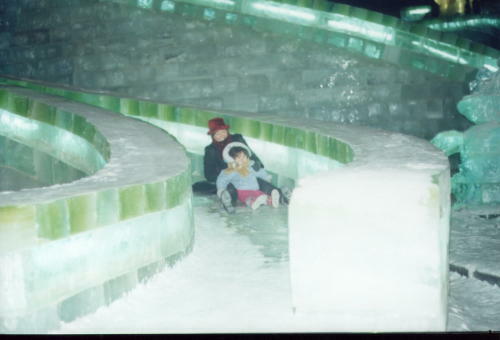 We couldn't see where the Ice Lantern Festival was. Apparently last year it was held almost right outside our hotel, but this year it had moved about a mile down the river. Outside the hotel which is located almost right on the river is a little square and down at the river they had horse drawn carriages, sled dogs and sledding available. The vendors were also out in mass and one particularly industrious man tried to get me to buy the girls some cotton candy, by simply giving it to them when my back was turned. Charlie had already dropped hers and Julie was eating some when I turned back around and saw them. It kind of hacked me off the way he did it, so I made them give it back to them and went on. I priced a few items and saw that they were trying to rip me off so I didn't buy anything. I thought if I needed anything I'd better wait for Nancy to bargain for me. After walking around a bit we went back to our room and had a much needed nap. The girls each slept for over 2.5 hours. Nancy and Sarah came back while Julie and Charlie were napping and they had a rest as well. I woke everyone up at 2:30, Miss Antsy Pants (me) couldn't stand to just hang around the hotel doing nothing....we were on vacation and needed to go go go (hey Linde, my sister, does this sound familiar?) We took off, hoping to walk to St. Sophia Church. It had snowed and the walk was really slippery. What should have been a 15 minute walk took over an hour and we never did make it. It was starting to get dark and I knew I wouldn't be able to get any decent pictures so we stopped for dinner at, another first for Nancy and Sarah, Kentucky Fried Chicken. They both agreed that KFC beats McD's hands down. After dinner we headed back to the hotel, stopping at one of the squares to play on the snow. 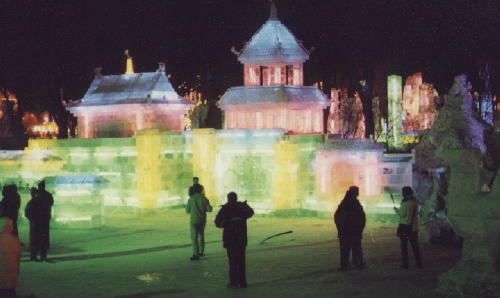 There are many squares in Harbin and there were ice sculptures everywhere. 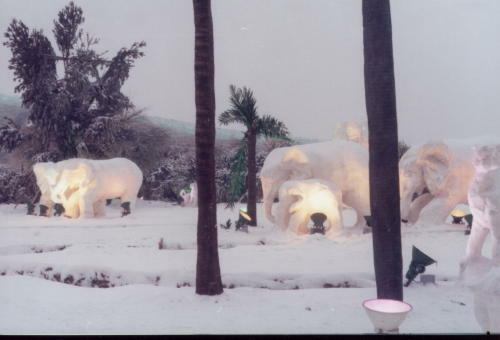 They were all lit up at night making the whole city a winter wonderland. Once I got my maocu and lycra pants on under my jeans I was fine and it really didn't seem all that cold. About all that got cold on the girls during our stay was their hands and this is because their gloves would get covered with snow and ice when they played. 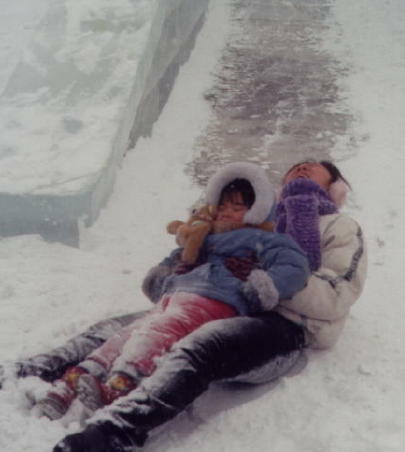 I never did find any of those nice warm mittens with thinsulate that were small enough to stay on their little hands. 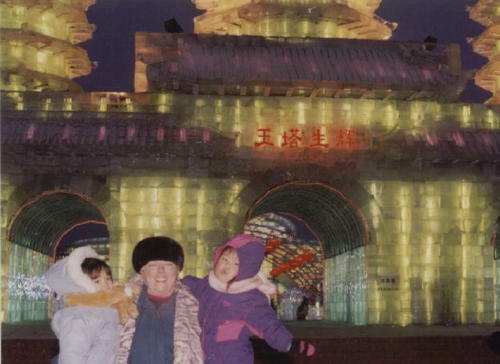 I'd made email contact with an American family who lives in Harbin, Chris and Melinda Thompson. They have 3 boys who range in age from just turned 4 to 9. 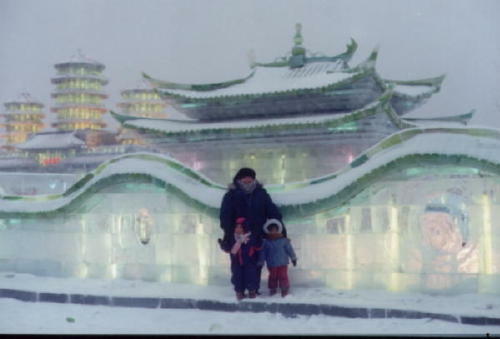 We made arrangements to meet them the next day at McDonalds for lunch and then we'd walk over to Zhaolin Park to see the ice sculptures there. We met and really hit it off. The Thompson's are an absolutely wonderful family. Both Melinda and Chris were so nice. Chris teaches at one of the local middle schools and Melinda is a work at home mom (and in China house work is truly work) who is home schooling her boys. After our late lunch we all headed to the park which is only about a block away from the hotel. 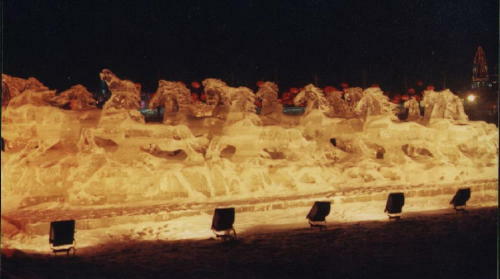 The ice sculptures there were breath taking. There were huge pagodas, dragons and my favorite a huge arbor that crossed a creek and was even covered with grape vines and grapes. When the lights came on at dark (it starts getting dark around 4:15) it was fabulous. I only hope the pictures I took turn out. I wished I knew more about camera's and f stops and the lot so I could take pictures at night. My digital camera which can take pictures in fairly dark conditions doesn't work in temperatures less than 35 degrees or so, so I was using a regular 35 mm camera. We had stopped in a little coffee hut to warm up while the boys played outside on some of the ice slides. After we went back outside Charlie was a little cranky so I picked her up and she promptly fell asleep. Chris took her and we all headed to one of their favorite restaurants for dinner. It was about a block on the other side of the park. We shared a wonderful meal. The food in Harbin isn't as greasy as it is here in Jinzhou. Chris and Melinda walked us back to the hotel and we all turned in for the night. Even Charlie who had slept through most of dinner, turned in with the rest of us. The next morning we got up and headed over to St. Sophia church. We'd almost made it the other evening and I didn't realize how close we were when we stopped at KFC. It was just a few hundred feet farther.....oh well. The church was built by the Russians in 1907. It was really beautiful. It even has those onion domes on it. We took several pictures before heading back. 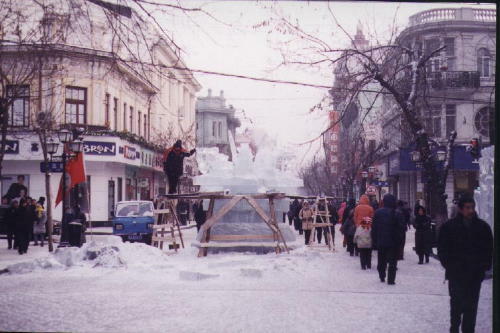 That afternoon we left the hotel and headed out to the main Ice Festival. 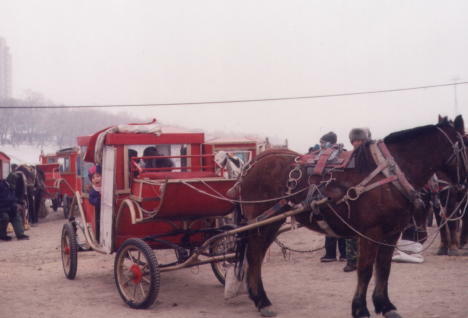 Having no idea how to get there, we took one of the horse drawn carriages across the frozen river. It cost 50 yuan and we probably got ripped off, but it was fun. Even by carriage it took about 20 minutes to get there. We arrived at dusk, they had just turned the lights on. It was stunning. When we got out of the carriage we were immediately approached by a couple who had tickets they tried to sell us. They told Nancy tickets at the gate were 50 yuan but they'd sell us theirs for 45 yuan. It sounds a little fishy to me so I told them boo (no in Chinese) and began walking off. The man then told Nancy they were real tickets and he'd wait for payment until we were inside the gates, I again told him no and proceeded to walk off. I was ahead of the rest of them and saw a policeman. I motioned for him to come here and he did. When I turned back around, the woman had walked off and the man started to. The policeman knew immediately what was going on and grabbed the man and then asked Nancy if this was the man who had tried to sell her the tickets. The man had put the tickets in Nancy's hand, but since no money had changed hands we were ok. I took the tickets from Nancy and gave them to the policeman and told her come on let's just go and walked off to the ticket booth. Fortunately the policeman didn't try to detain us and I have no idea what happened to the illegal ticket seller, but a cab driver told Nancy later he could be put in prison for 2 years for doing that and have a hefty fine as well. I'm not taking any chances here. I am a guest in this country and want to do everything by the book! As it turned out since Nancy and Sarah are students, their tickets were half price or 25 yuan each and my daughters were free. We stayed at the festival for a couple of hours. It was wonderful. 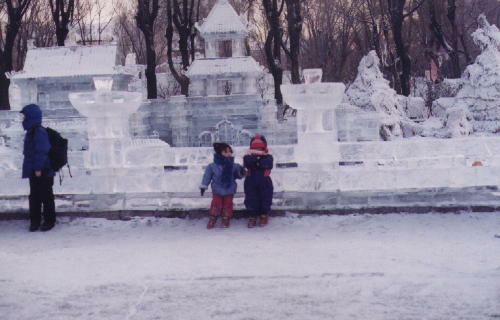 There were ice and snow sculptures everywhere. The biggest was what we called Cinderellas Castle. It look just like Cinderella's Castle at Disneyland. 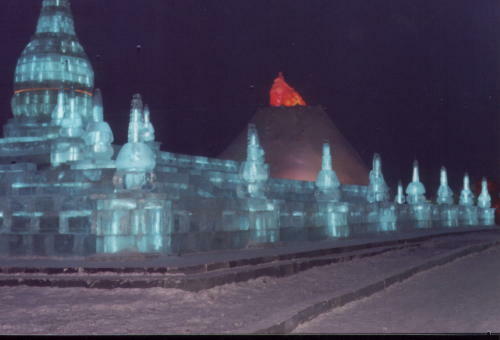 There was also a Forbidden City replica, a giant laughing Budda made of snow, several windmills and many other sculptures. I've never seen anything like it. It was quite something to see. I'd heard about the festival while still in the States and wanted to go. I must say I'm glad we did. We all liked it so much we went back the next day. On our final morning in Harbin we met up with the Thompson's again at McDonalds for breakfast. Melinda and I then went to a huge department/supermarket store. What a selection of stuff. They even have olive oil and macaroni. I bought some goodies to eat on the train and had a really nice visit with Melinda. We headed back to the hotel and said good bye to our new friends. Sarah's friend had come by to see us off at the train station. We got to the station about 1:45. You would not believe the crowd. 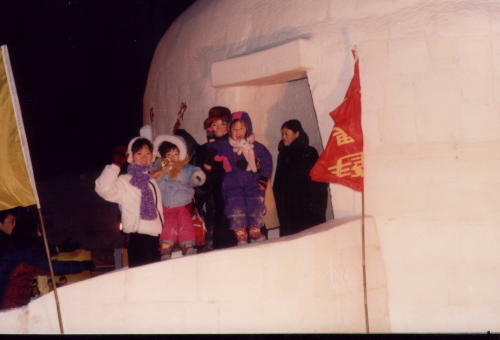 It seemed like the entire population of Harbin was there, fortunately Sarah's friend (no English name and a really hard to pronounce Chinese name) accompanied us all the way to the train platform. They let us begin boarding the train a few minutes before 2. They really needed to begin boarding about 30 minutes before the departure time. It was jam packed. People pushing everywhere. I was doing my best linebacker imitation to keep space for my daughters with Sarah at my side trying to do the same thing. I really think they could have been trampled in the crowd. It was awful. Sarah said she's heard it is even worse during Spring Festival when everyone travels, but she said this was the worst she'd ever seen it. We'd purchased hard seats since the train was due in Jinzhou just after midnight, BUT I took one look at those hard seats and went NO WAY. The hard seats I'd ridden on before to Shenyang were nothing like these. These were literally vinyl covered benches and there was noway my big duff could sit there for almost 10 hours. I didn't even sit down. Sarah sat with the girls and our stuff while Nancy and I went to find the condutor and see if we could upgrade to hard sleeper or even soft seats. We had to pass through 5 obscenely crowded cars to get to the place where you could upgrade your tickets. We stood in line for about 30 minutes and were able to obtain 2 bottom sleepers and a top. I went on to the sleeper car while Nancy went to fetch Sarah and the girls. It was definitely worth the extra 200 yuan to upgrade. We had plenty of space and the girls were able to move around. Charlie fell asleep around 7:00 and Julie around 9:00. Again as before the lights were turned out at 9:30 and we all dozed/slept. The conductor woke us up at 11:30 and we got our stuff together and got coats and boots on the girls. The train pulled in to Jinzhou at 12:03 and I think we were the only one's to get off. We caught a cab home and thus brought the end of our wonderful vacation in Harbin.